Obviously, we all want our wedding to be as beautiful as possible. That comes as little surprise. However, sometimes it simply costs too much, which can be devastating for the bride and the groom. A terribly sad situation, that; one we’d like to avoid. And well, to be honest, it is can be an easy one to avoid! When it comes to weddings too often we assume everything must be expensive and also outsourced. Of course, there are certain things that must be outsourced, like our wonderful marquees, but not all must be. We’re going to run through how you can decorate your tables on a budget, making your wedding a more personable experience, too. A win-win, in reality. 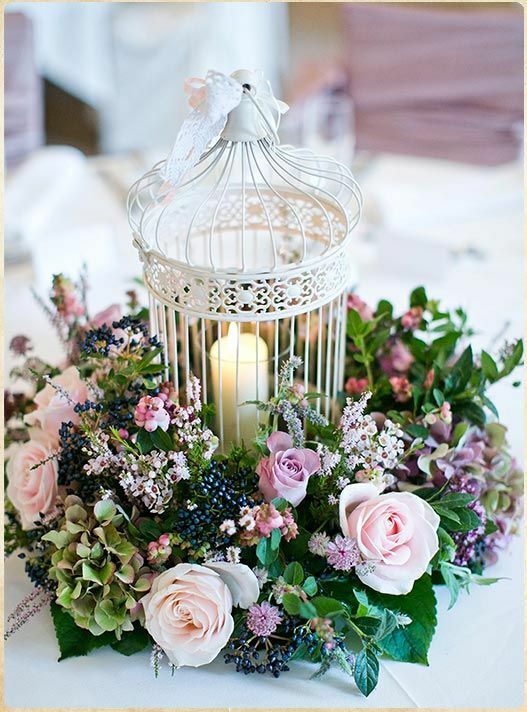 Vintage bird cages are inexpensive and have an undeniably charming, rustic look to them. They’re a great option for your centrepiece! You buy a few off Amazon for cheap, or even better, go and find unique ones you or family may have lying around. Not only does that add character, it’s free, too. These look great empty. However, if you’d perhaps a wider variety of colour on your tables you can fill them whatever you like. We’ve seen people fill these cages with their favourite flowers, some have even filled them with lemons and limes. It sounds odd, but it looked great! It may sound silly, but mason jars really are a canvas for creativity. And, a big positive, they’re incredibly cheap to buy in bulk. 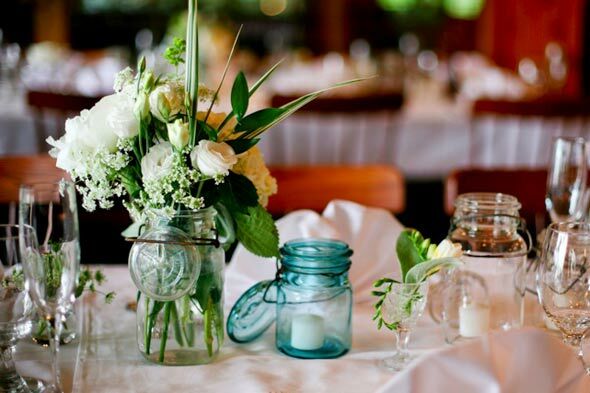 Just how would mason jars, in any world, look good as a wedding table centrepiece? A good question. You can do many, many things with mason jars, like for example, fill them with fairy lights. That makes the table look very angelic. Or, you can fill them up with water and have floating candles in them. As the day turns to night it looks very beautiful. These are just two suggestions, have a look at this Pinterest board for more! Sometimes the best thing to do is just spend some time thinking about how you can use what you already have. We’ve seen tables adorned with the bride and groom’s favourite wine and beer bottles (empty and filled with flowers, of course). We’ve also seen couples place their favourite wine glasses upside down and put candles on top. We know, it sounds weird, but it looked beautiful! So, as we said, don’t be afraid to get creative! If you have a marquee like one of ours, you can really get creative with your wedding as all the rules go out the window! You get to create a wedding of your own, rich with your personality. If you’d like that, give us a call and get yours booked!